Available in Hardback, Paperback, and Kindle. Thank you to Little, Brown via Net Galley for the review copy. When I read ‘The Girl Who Fell From The Sky’ I wanted the story to continue and ‘Tightrope’ is that sequel. It had me gripped with every page turned just like the first book. We now catch up with Marian Sutro at the Wars end, she has survived in more ways than any of us could imagine. Marian survived being captured by the Germans while on operations in France, survived the interrogation by the Gestapo at their infamous Paris HQ and survived living in a concentration camp. Marion now home in England is struggling to cope in a post war life, she is decorated for her work a heroine. But Marion is not coping with life. What next for her. The last days of WWII see the Atomic bombs in Japan, a Cold War starting with Russia. Marion actually played a part in the development of the bomb. How does she feel now when the news of the first atomic blast in Japan. I adore the way in which Mawer tells his story, he carries the reader along with the lead character in a tender but gripping way that made each turn of the page more exhilarating. This story is so believable it could almost be true, imagine if you will a trainee spy taught how to shoot and to kill and then go into the field and do all those things and the unspeakable horror of being tortured and then life and all the hell she witnessed in the concentration camp. Marion Sutro survived. Returned to her family broken. ‘Tightrope is a book that I hoped for from Simon Mawer and I applaud his skill and bringing Marion Sutro to life, with immense skill but with tenderness. At times this was a painful read as you are there with Marion. But I absolutely loved this book. This would make a gripping TV drama and I hope one day it achieves this. It deserves to be seen. Simon Mawer was born in 1948 in England, and spent his childhood there, in Cyprus and in Malta. Educated at Millfield School in Somerset and at Brasenose College, Oxford, he took a degree in biology and worked as a biology teacher for many years. His first novel, Chimera, was published by Hamish Hamilton in 1989, winning the McKitterick Prize for first novels. Mendel’s Dwarf (1997), his first book to be publish in the US, reached the last ten of the Booker Prize and was a New York Time “Book to Remember” for 1998. The Gospel of Judas, The Fall (winner of the 2003 Boardman Tasker Prize for Mountain Literature) and Swimming to Ithaca followed. In 2009 The Glass Room, his tenth book and eighth novel was shortlisted for the Man Booker Prize. Since then he has published Trapeze (The Girl Who Fell From The Sky in Britain) Tightrope is the sequel. 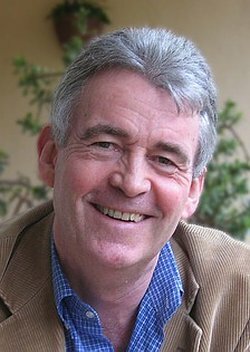 Simon Mawer is married and has two children. He has lived in Italy for the past thirty years. 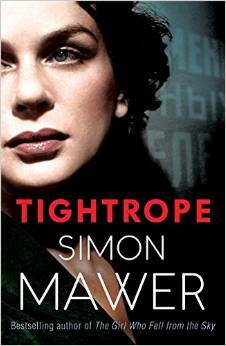 Posted on May 27, 2015, in Little Brown Book Co, Simon Mawer, Tightrope. Bookmark the permalink. Leave a comment.